Trained pages - These are content pages that have been annotated in ways that Talla can build ML/AI models off of the content. Verified pages - These are pages in which a human has verified that the content is up to date. Training complete - This metric tells you how smart Talla is so far, and how much more you need to train Talla to have your entire content repository covered so it is intelligent and automatable. 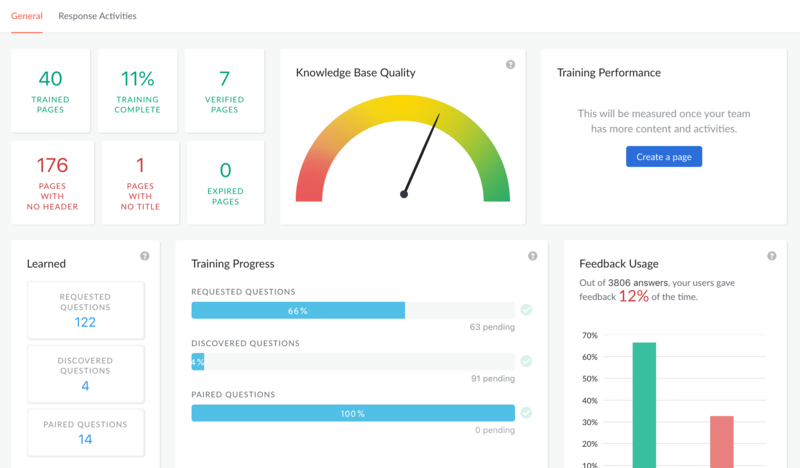 Knowledge Base quality - This metric is a gauge of the overall quality of your knowledge base and encompasses whether or not the content is up to date, if it is useful to the users asking questions, and if the content has been trained in ways that help Talla learn. The training progress metric shows you questions that reps, or customers, ask about your content, and how well Talla is finding and pairing up answers. Requested questions are those that users couldn't find answers for and have requested an answer, or that content be created for the answer, by a subject matter expert. Discovered questions are those questions Talla has found from monitoring other tools like Slack, or Zendesk. Paired questions are those that were created specifically in Talla and entered in our annotated format. Talla shows how many are open for each category, and what percent have answers. This is really a measure of how well you are teaching Talla. This section shows you what Talla has learned to date. It is similar to the training progress metric but, is more cumulative and backwards looking.There are other items you can see if you play around with the training page, but these are the highlights for now. Our goal with this page was to help you understand that an AI model needs to be trained and updated, much like a person, and this gives you a measure of where the AI is at any given point. The nice thing about AI is that, once it is trained, it is scalable to an almost infinite degree, and works for you 24/7. If you want to get a demo of Talla to see how we regularly save support organizations 7 figures worth of costs with automated responses, actions, and increased rep productivity, then please sign up here.